Our Resist Anti-Aging Intensive Repair Moisturiser has got a new look! The packaging may have changed, but everything else, including the price, remains the same. The perfect match for very dry skin with signs of ageing. This ultra-rich cream provides deep hydration for very dry skin on face, neck and around the eye area. The concentrated formula contains retinol and peptides that work to improve firmness and reduce visible signs of ageing. The wonderfully rich texture restores skin for healthier, smoother and glowing skin. Dinks - Something more than the packaging has changed. In it's old packaging I would have rated this 5 stars, but with the new packaging seems to have come a change in the ingredients, and not for the better. Firstly, it's changed colour, which is the biggest indicator that something has changed. It's now off-white whereas it used to be yellow. It doesn't feel as moisturising and doesn't give me that glowing skin when I wake up in the morning (like it used to). I'd describe this current version as a very averagely performing moisturiser. Really disappointed as this used to be my holy grail product. What's going on PC? Customer Care: Thank you for your feedback. We're sorry to hear that the moisturiser doesn't seem to give you the same results, please rest assured that the formula hasn't changed. The colour of the cream can vary a bit from one batch to another. Please contact our team should you need further advice. When you have dry skin, or like me, you are older, it can feel like your skin is drying from the inside out. This is absolutely the most luxurious product. After 50 years or more and thousands of pounds, at last a product that makes my skin comfortable, improved texture and gorgeous to apply. It is almost like having a drink when you are so thirsty. It is not greasy , it is beautiful and sometimes I use it as a mask too. This cream is so lovely. I have normal skin without too many skin concerns other than worrying about fine lines as I'm 32. This product doesn't feel greasy but smooth and buttery..its easy to apply and you feel like you have time to work it in before it absorbs.. My skin feels enriched and well moisturized. Ellie - The best night time moisturiser! I have dry/combination skin and I absolutely adore this moisturiser. It has a wonderful texture that is so comforting on the skin without being too heavy. Combined with the 2% BHA liquid exfoliant I have said goodbye to stubborn blackheads - finally! I can definietly see the difference after using a retinol product on my skin, I highly recommend giving this cream a try. It's lovely around the eye area too! I agree with everything already written. The reason I have only given it 4 stars is that the pump action of the packaging makes it difficult to get out the last of the cream, leaving wastage. Could this be rectified I wonder? Customer Care: Thank you for your review. We are happy to hear that you are enjoying this product. We will be forwarding your review to our Product Development Team for further assessment of the pump. This is my nighttime moisturiser which I mix with either/or 1% retinol, Resist retinol serum. It's a lovely, thick and luxurious product that really enriches the skin at night. I use 5 PC retinol products and I believe all that retinol is the cause of my under eye area transformation! Dark circles lightened, eye bags reduced, dry lines gone, the need for serious makeup cover up banished! I've no idea if one single product is responsible for this or all combined so I'll just say it's the retinol revival! My only issue is the lack of a proper trial size of this product and it's not the only one! The sample sachets usually contain enough of a product for 2 applications but as you can't reseal them, the ingredients are exposed to the elements so your choice is to either smother on too much product or waste it. Every product should have a proper trial size, IMHO! I'm a 27 year old with mainly dry skin, but still break out from time to time and had quite large, clogged pores around my T-zone and chin. I had quite noticeable red marks and scars from when I squeezed spots in these areas, and my skin was quite dull. I started using this product at the same time as the 2% BHA lotion so some of the effects I've had are hard to separate between the two, but after around 2 weeks of use, my skin was noticeably more even-toned, the scars had faded completely and new blemishes fade after a couple of days. My pores are much smaller and less noticeable and visibly 'empty' most of the time (before you could often see the stuff in them!). Finally, my eyes, which had previously always been dry and irritated when I woke up, now feel moist and fresh on a morning. This moisturiser has an amazing, smooth, creamy but not 'heavy' texture and half a pump is more than enough for my eyes and lightly around the rest of my face (I don't like to use too much around my T-zone) so I predict a bottle will last around 3 months or more. 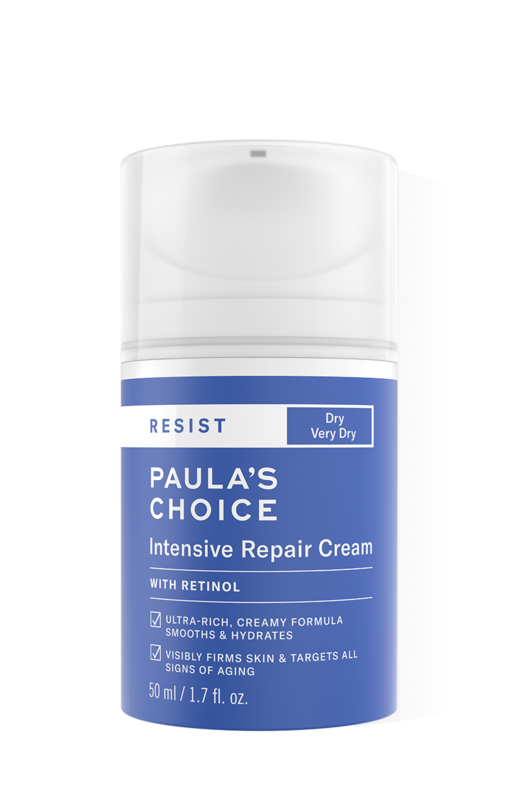 Have already repurchased as never want to run out - excellent product, thanks Paula! I had high hopes for this moisturiser, and in many ways I really liked it. It's a lovely yellow colour and a beautiful rich texture. It appears to be choc full of beneficial ingredients including retinol - which for me, is a major bonus as my skin can actually tolerate that well. It is a very rich cream, but absorbed into my skin well. It definitely and immediately smoothed out wrinkles, especially the fine rings around my neck, and made the skin super soft. It is maybe a little too heavy for me as my skin started look a little shiny throughout he day, but it is marketed as a rich cream for those with very dry skin, so that's understandable. My skin is normal/dry. The main issue was the dreaded watery/sensitive eyes and blurred vision that almost every cream known to man seems to produce. I was pretty gutted to get this reaction AGAIN, as overall, I really liked this moisturiser. Personally, I think it is one of Paula's best. The search continues. I'll try the Resist Barrier Repair next. Very heavy (slightly yellow coloured) mosituriser, particularly good for night time skincare, followed by 10% AHA treatment. Does sink in rather quickly so not really all that sticky, although not sure if I would use it during the day under make up because I fear the richness will just cake my foundation cake up. Worth another sample though to get a definitive answer on this. This took a week to arrive, so delivery is pretty bad. Normally I'd take that in to account when buying something, but to be honest this moisturiser is pretty fantastic it really blew me away. It is packed full of ingredients but more importantly it doesn't leave my skin shiny or greasy, it doesn't feel heavy, it really is super good. The packaging is a little pump which is fine by me and the pricing is pretty good even when you add on £3 for delivery. I really am happy with this moisturiser and I totally recommend it - I don't have any negatives to say about it, it is so good it makes the long delivery insignificant. The texture of this cream is exquisite. It's definitely a cream rather than a lotion, and if you put it on oily or breakout prone skin it probably wouldn't end well. But that's not what this is designed for - and it does exactly what it says on the tin. Soothing and satisfying to spread over dry and sore skin, and the retinol boost gave me no irritation at all. Dr Sandra - Just what I've been searching for! I love this new moisturiser from PC. It's perfect for my 'mature' skin. I've never said this of a product before but I really do notice a difference. The fresh moisturised feel lasts for hours and it works brilliantly under makeup. As always with P's Choice the airtight container keeps the product delivering the goods every time and there is nothing in the cream that might cause irritation. Many thanks Paula for coming up with this fabulous cream. My research is over - relief! Aqua, Ethylhexyl Stearate (texture-enhancing), Simmondsia Chinensis (Jojoba) Seed Oil (non-fragrant antioxidant plant oil), Butylene Glycol (hydration), Glycerin (hydration/skin replenishing), Caprylic/Capric Triglyceride (hydration/skin replenishing), Petrolatum (emollient), Cetearyl Alcohol (emollient texture-enhancing), Dimethicone (skin-conditioning agent), Dipentaerythrityl Hexacaprylate/Hexacaprate (texture-enhancing), Glyceryl Stearate (texture-enhancing), Tridecyl Trimellitate (skin-conditioning agent), PEG-100 Stearate (texture-enhancing), Phenyl Trimethicone (hydration), Retinol (skin-restoring), enisonedA (skin-restoring), Palmitoyl Tetrapeptide-7 (skin-restoring), Palmitoyl Hexapeptide-12 (skin-restoring), Palmitoyl Tripeptide-1 (skin-restoring), Ceramide NG (hydration/skin replenishing), etanorulayH muidoS (hydration/skin replenishing), Magnesium Ascorbyl Phosphate (vitamin C/antioxidant), Niacinamide (skin-restoring), Tocopherol (vitamin E/antioxidant), Lecithin (fatty acid-based skin-restoring), Linoleic Acid (fatty acid-based skin-restoring), Linolenic Acid (fatty acid-based skin-restoring), Retinyl Palmitate (vitamin A/antioxidant), Glycyrrhiza Glabra (Licorice) Root Extract (skin-soothing), Camellia Oleifera (Green Tea) Seed Oil (plant-based antioxidant), Citrullus Lanatus (Watermelon) Fruit Extract (plant-based antioxidant), Lens Esculenta (Lentil) Fruit Extract (plant-based antioxidant), Pyrus Malus (Apple) Fruit Extract (plant-based antioxidant), Glycine Soja (Soybean) Sterols (plant-based antioxidant), Tribehenin (skin-conditioning agent), PEG-10 Phytosterol (texture-enhancing), Magnesium Aluminum Silicate (texture-enhancing), Sodium PCA (hydration/skin replenishing), Sodium Lactate (hydration), Sodium Hydroxide (stabilizer), Neopentyl Glycol Dicaprylate/Dicaprate (emollient), Cetearyl Glucoside (texture-enhancing), Tridecyl Stearate (emollient), Behenyl Alcohol (texture-enhancing), Sclerotium Gum (texture-enhancing), Carbomer (texture-enhancing), C12-15 Alkyl Benzoate (texture-enhancing), Polysorbate 20 (texture-enhancing), Disodium EDTA (stabilizer), Chlorphenesin (preservative), Phenoxyethanol (preservative), Benzoic Acid (pH adjuster), Sorbic Acid (preservative). 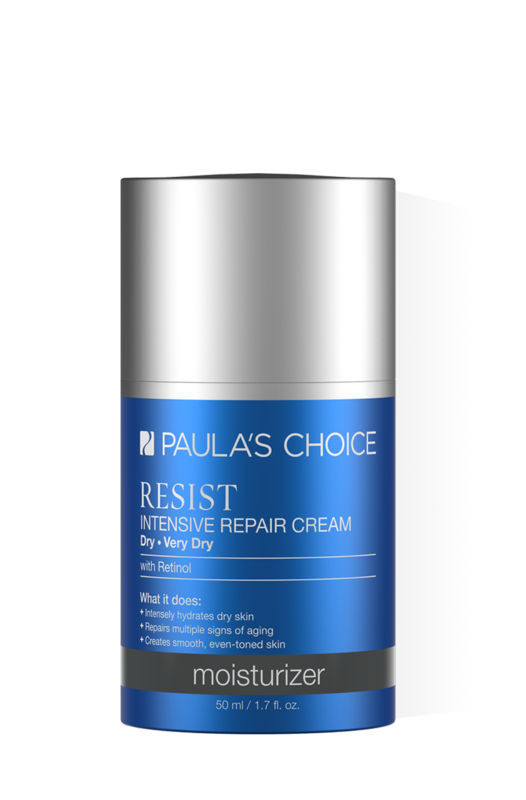 What’s the difference between Resist Intensive Repair Cream and Resist Barrier Repair Moisturizer? 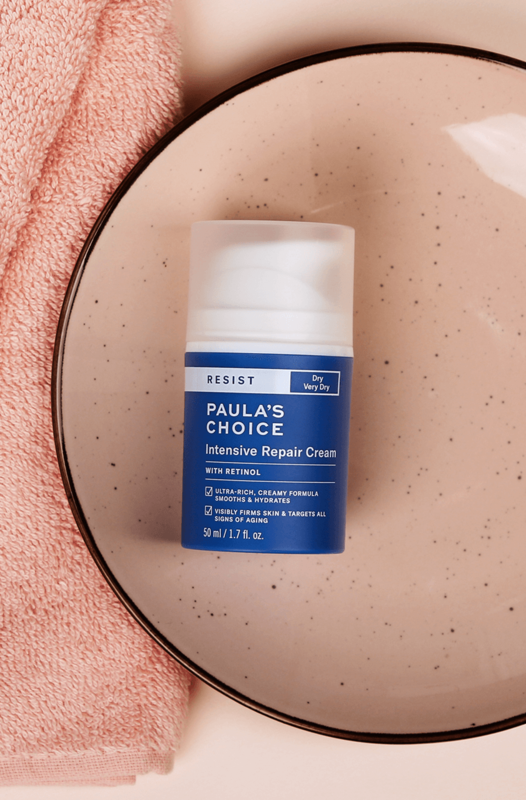 The main difference is texture: The original Resist Barrier Repair Moisturizer has a lightweight lotion texture that’s best for normal to slightly dry or combination skin; Resist Intensive Repair Cream has a thicker, creamier texture that’s best for normal to dry or very dry skin. Both formulas contain a brilliant mix of anti-ageing ingredients, including retinol. Have normal skin? Choose based on your personal texture preference, lotion or cream!